(SitNews) - The High-Frequency Active Auroral Research Program doesn’t do anything ominous, despite what people say on the Internet, according to Bill Bristow. “It’s really just a large radio transmitter,” said Bristow, HAARP’s chief scientist. Bristow gave a public talk about the facility as part of the 2016 Science for Alaska Lecture Series. 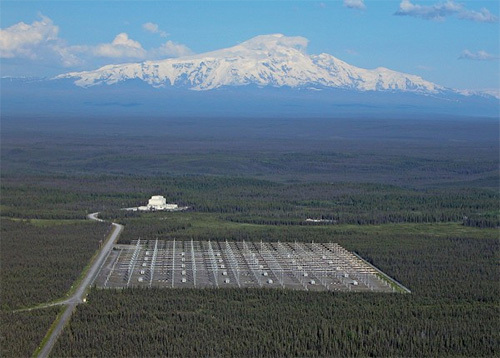 After acknowledging the conspiracy theories surrounding the facility in Gakona, Alaska, Bristow explained the history and science behind HAARP and why continued research there is important. The High-Frequency Active Auroral Research Program site, Gakona, Alaska, is pictured with Mount Wrangell in the background. 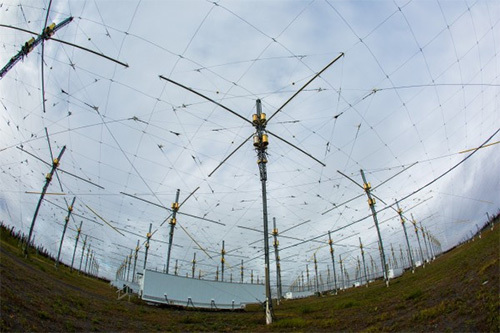 Scientists at HAARP use the antenna array to heat bits of the ionosphere to study natural electromagnetic processes caused by solar winds and the Earth’s magnetic field. They also want to understand how the ionosphere affects radio signals, important for communication and navigation systems used by both civilians and the military. The scientific equipment is now owned by the University of Alaska and operated by the Geophysical Institute. The land and buildings are owned by the Air Force Research Laboratory, which UAF hopes to have conveyed via congressional action in the next two years. 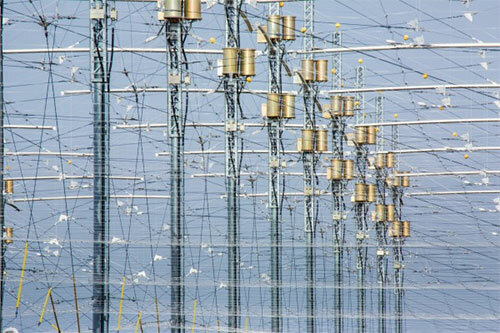 HAARP’s primary component is the Ionospheric Research Instrument, an array of 180 high-frequency tower antennas spread across 33 acres and capable of radiating 3.6 megawatts into the upper atmosphere and ionosphere. Construction costs over the life of the project were nearly $300 million. A researcher will use the antennas to send a radio wave into the ionosphere to interact with it in a particular way. The wave excites the ionospheric gases, and diagnostic machinery at HAARP examine the reactions. The ionosphere is the band of atmosphere around the Earth that is ionized by solar and cosmic radiation. That means the atoms in this area, about 47 to 621 miles high, have been stripped of one or more of their electrons. The bright lights of the aurora are a demonstration of this process. In some ways, the signals map what is happening in the ionosphere, such as what happens when the aurora heats the atmosphere. Bristow explained that the idea of experimental heating of the ionosphere began with something called the Luxembourg Effect. In 1933, people in England found when they tuned into a Paris radio station they also heard a faint broadcast from a Luxembourg station and vice versa. Both were broadcast on different frequencies. C.W. Palmer explained the effect in a 1935 paper. The radio waves from both stations were mixing in the ionosphere’s electrons, causing cross modulation. Intrigued by the Luxembourg Effect, scientists began to purposefully seek ways to heat the ionosphere from the Earth, not space, Bristow said. The Platteville Atmospheric Observatory in Colorado was an early example. Construction on HAARP began in 1993, supported by federal earmark money from Sen. Ted Stevens. Early on, the Naval Research Laboratory was extremely interested in studying how to use the ionosphere to communicate with submarines. Ocean waters are not good radio signal conductors, but researchers found they could ping a submarine using a very low-frequency signal created in the ionosphere. The Defense Advanced Research Projects Agency, the research arm for the Department of Defense, was interested in using electromagnetic waves to remove charged particles from an area around Earth called the Van Allen Belt. The belts are “two donuts of seething radiation that surround the Earth” that contain charged particles held in place by the Earth’s magnetic field, according to NASA. The particles are hazards to spacecraft, including satellites, Bristow said. HAARP was in a good location to do the experiment. Between 1999 and 2006, 20 major research campaigns and many smaller studies were conducted at the facility. UAF researchers were a large part of the work. Findings have been reported publically in science journals. By 2014, the Air Force Research Laboratory ended its research program and, without the budget to continue operations, began to close the facility down. Robert McCoy, GI director, and others successfully campaigned for a handover of the facility to the university in August 2015. Since then, the GI has been securing appropriate licenses and permits to operate the five 2.6-megawatt diesel generators and bring the equipment and instruments online. “We intend to operate the facility as a general observatory for subauroral physics, similar to the way we operate Poker Flat Research Range,” Bristow said. The GI is seeking support from the National Science Foundation, the Department of Energy, the Air Force, DARPA and others. They also are looking for scientists who want to conduct work there. “If we can find sufficient support, HAARP will be one of the premier observatories for ionospheric physics, magnetospheric physics and radio science,” Bristow said. This article is provided as a public service by the UAF Geophysical Institute. Diana Campbell [dlcampbell@alaska.edu] is a communications professional with the Geophysical Institute. Representations of fact and opinions in comments posted below are solely those of the individual posters and do not represent the opinions of Sitnews.